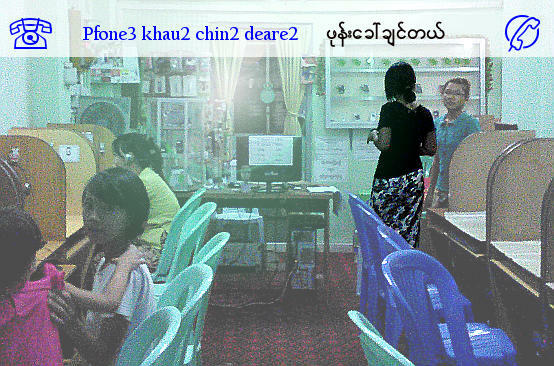 One cheap way to make long distance phone calls in Myanmar is to go to the Internet Cafe. Many of Internet shops known as Public Access Centers (PAC) offer Voice Over Internet Protocol phone calls through the Internet. If you must make frequent calls for several minutes at a time, this definitely makes more sense than using International Direct Dialing (IDD) phone calls from your hotel, or from the house that you are renting, or worse, from the house of your host that you are staying, because he will end up with astronomical phone bills! This is very practical way for many foreign businessmen in Yangon who call back to their office or home in their countries. August 2015 Update: SIM cards for mobile phones are now cheaply available. One alternative is to just bring your smart phone or a tablet with a slot for SIM card. You can then use Internet (VIBER, SKYPE, Facebook, etc..) for long distance calls. However, there are still bandwidth problems and slow connections at the peak usage hours. With cheap SIM cards, you can also make local calls, provided that your mobile service provider does not use SIM-lock to prevent changing service providers. Another option for local calls is just buy an inexpensive phone with SIM Card. Top-up cards with PINs are available everywhere. February 2016 Update: Myanmar will remember the bygone days of Inernet Shops described in this lesson. Most of them are now out of business as mobile phone penetration and Internet access from the smartphones have reached a high level. First, let's recall the phrase chin2 deare2 used in Lesson 7.
xxxx chin2 deare2 means "I want to xxxx" where you substitute "xxxx" with the activity that you want to do. So, in this case, you substitute xxxx with the verb "pfone3 khau2", which means "making a phone call". It's better to tell the shop attendant where you want to call right away. Myanmar Grammar Notes: The word "go2" is a postpositional marker in the above sentence, which makes "the place being called = YYYY" the object of the sentence. You might want to ask how much it costs a minute to make the call. Sin2-ga1-pu2 go2 pfone3 khau2 chin2 deare2 -- I want to make a call to Singapore. ta1 ma1-nit beare2 lout leare3 -- How much a minute? Myanmar Grammar Notes: ta1 ma1-nit refers to the noun pfone3-khau2-kha1 -- "fee for the phone call" without mentioning it. Therefore, it is a pronoun. "1 minute" indirectly refers to the noun "phone fee". "1 minute" of what is not made clear. It will be an adjective in "pfone3-khau2-kha1 ta1 ma1-nit" -- "1 minute of phone fee". Similarly, the question word beare2 lout can be either pronoun or adjective depending on whether the noun in the question is explicitly stated or not. Burmese people pick up the phone and answer the call just like English, but with slightly different pronunciation. ka1-lin2.. ka1-lin2.. ka1-lin2 -- Ring.. Ring... Ring tone in Burmese just like in the comics." Please also refer to Lesson 4 on different phrases used by male and female. May2-Lin3 yay2 -- Hey, Mei Ling..
a-pyin2 htwet thwa3 ba2 deare2 -- She went out. May2-Lin3 pyan2 ma1 la2 thay3 ba2 bu3 -- Mei Ling hasn't come back yet! May2-Lin3 yay2-cho3 nay2 ba2 deare2 -- Mei Ling is taking a bath. kate-sa1 ma1-shi1 ba2 bu3 -- No problem. kha1-na1 nay2 pyan2 khau2 meare2 -- I will call back later. Take note that the word nay2 can have different meanings depending on the context. If you recall in lesson 2, nay2 koun3 la3 means "how are you?" nay2 also refers to the sun. The word nay2 deare2 is equivalent to the present participle [...ing] in English. For example, yay2-cho3 nay2 deare2 means he/she is or I am taking a bath. yay2-cho3 nay2 ba2 deare2 is more polite form of the same meaning. What if the person is in? And, how would you say there is a phone call for you? pfone3 la2 nay2 deare2 -- There is a phone call for you. pfone3 hma3 nay2 ba2 deare2 --- You've got the wrong Number! "Wait... wait.. please don't hang up yet.. What's your name? Can you make this the right number?" Sounds too desperate, isn't it? Cartoonist Jim Davis came up with that line (or something like that) for the character Jon, the owner of Garfield the cat. What's that? The phone is ringing. Got to go now!